UPDATE - 3/15@1:04PM: The set includes some exclusive new liner notes written by Ray Wawrzyniak (who was profiled in the Rush: Time Stand Still documentary). Eric at Power Windows has transcribed these liner notes and made them available online at this location, and John at Cygnus-X1.net has scanned several new images included in the set here. 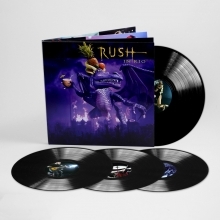 The 4-LP vinyl edition of Rush's 2003 live album Rush in Rio that was announced back in November is now available for purchase. The set is produced on 180 gram vinyl with a newly designed heavyweight gatefold jacket, and also includes a download card containing all of the tracks. The set is now available for purchase via Amazon and other retailers. The live album/film was originally released as a 3-CD/2-DVD set on October 21, 2003. This is the first time it's been made available on vinyl.